Second in the Triple Crown, the Preakness features the Black-Eyed Susan Cocktail which combines pineapple, orange, and lime juices with vodka and St. Germain Elderflower liqueur. It’s fantastic and a great drink all summer long! Everyone associates Mint Juleps with the Kentucky Derby, but with the Preakness race coming up this weekend I thought it fitting to share ‘the’ signature cocktail for these stakes too, the Black-Eyed Susan Cocktail. The Black-Eyed Susan is billed as the “Official Drink of the Preakness.” It does seem that the term ‘official’ is pretty loose; this is not like the mint julep in that some components are absolutely necessary and have remained constant throughout the years. With the Black-Eyed Susan it seems that over time the recipe has gone through a fair share of revisions. The Baltimore Sun’s Rob Kasper has said, “like a racehorse that keeps changing jockeys, the Susan has changed recipes.” I found variations that included orange liqueur, rum, bourbon and a variety of juices. So I stuck with the version on the official Preakness website but this lively cocktail is certainly open to interpretation. It doesn’t seem to matter to attendees; numbers sold a few years back at Pimlico indicate approximately 25,000 were sold on the Friday and Saturday of the race. That’s a whole lotta cocktails! I have to share this cool little adjustable jigger that was sent to me by the folks at Metrokane, best known for the Rabbit, their Wine Bottle Opener. This has been the answer to my prayers. I have a variety of jiggers and yet? NONE of them have accurate measures. They are all in the range of 1, 1.5 or 2 ounces but all a bit off. This little beauty has a slider that allows an easy way to measure any variety of shots for the cocktails I make; it has been a veritable Godsend. I no longer have 3 different jiggers littering my workspace since this arrived. Seriously, I love this thing! I also received some of their jumbo Chilling Stones; the metal cubes get chilled in the freezer and then used in a cocktail. They are beautiful and practical but more Manhattan than Black-Eyed Susan so I’ll show them in use another day. Seriously loved this cocktail. Pineapple, orange and lime juice are combined with St. Germain liqueur and vodka for a thoroughly citrus affair. Finlandia is a Preakness sponsor so the website cites that particular vodka but you can sub in any vodka you prefer. St. Germain liqueur is a less well known liqueur but becoming more widely available. The company’s website indicates that it is “the world’s first liqueur created in the artisanal French manner from freshly hand-picked elderflower blossoms.” It has a very distinctive taste that is hard to put a finger on but I’ve always thought it had a bit of a grapefruit edge. I used fresh squeezed juices for the citrus but admit, not for the pineapple juice. How do you squeeze a pineapple anyhow? I found juice in the refrigerator section of my grocery but canned would be fine too. So refreshing and worth making. Going to the races? You can enjoy one in the $10+ range. Or come on over…I’ll be hosting a party. We gather on Saturday for 15 minutes, a cocktail and a race. Quickest party in the world but luckily a cocktail that would be good any time of day. Now off to the races!! I was provided with the Metrokane ‘Rabbit’ Adjustable Jigger but all commentary is my own. I want to try the Brown Eyed Susan drink, and got that recipe here, I also got a cream cheese lemon bar recipe to try. They both look so yummy. Thanks for dropping by Stanette; hope you find many recipes you love! I want one of those jigger things too. I have three and they’re all different sizes. Very easy to drink…like a combination of fruit juices with vodka and then something just a bit mysterious from the St. Germain. So perfect. I had never heard of this drink but being from the city of the Derby I know about the other. I don’t know why that Mint Julep is so popular. I worked at the track 2 years in a row and we sold a gazillion and 1 of those things a day. This drink looks absolutely delicious and I printed it out to try. Thanks for sharing. I hope to be back in your area in the next year or two. My ultimate goal is to move back to Colorado but not sure if the Springs, Denver, Manitou Area or where just yet. The Mint Julep is probably popular because it is SO boozy…this drink is anything but, which sure bodes better for a day at the track doesn’t it? I’ve personally found that my favorite juleps have some fruit; that addition cuts the bourbon yet tastes great with it and for me that’s a win win. I’ve lived in a couple of other states; I never plan to leave Colorado; even with the occasional winter blizzard, it’s got the best summers I’ve ever known. NO humidity…yes, I love that! Thanks for following! I’m making this real soon! You inspired me ! Good to know I inspire someone…hope you enjoy it too Cindy! Wow, such striking and tasty drink. I love it! Thanks Lori; it’s really a great cocktail for summer; I know it will see regular rotation here! I’ve never had this drink! Definitely need to try it sometime — looks so refreshing. 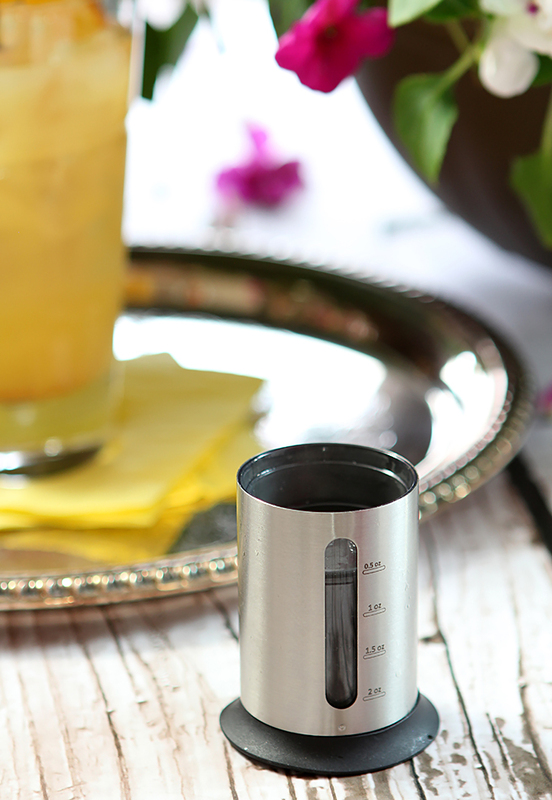 I use small measuring cups designed for bakers when I mix drinks — they have every measurement I need. When I mix drinks for a crowd, I use a Magic Beaker — big beaker-shaped measuring cup with all sorts of measurements on it — worth checking out. Anyway, really nice drink. And I’m always a sucker for drink photos with flowers in the background! Very good…should not be relegated to just one day! I had a great glass measure with ounces and jiggers and cups and even metric. Until I broke it. So I bought what I thought was the same last year and it was just recipes. Oh yeah, I need a glass with recipes on it. Just pitched it! I’ll use a larger measuring cup for a crowd but I still like a jigger for one or two drinks and this one is perfect! Interesting, your recipe is the exact same recipe listed on the Preakness website. I have St. Germain and will be making these tomorrow!